It would be hard to finish out National Women’s History Month without hearing about Helen Keller or her teacher. 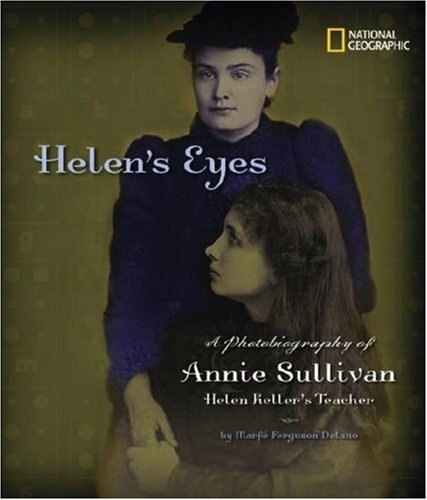 I thought that I had read all I needed to on the subject until I found Helen’s Eyes: A Photobiography of Annie Sullivan, Helen Keller’s Teacher, by Marfe Ferguson Delano. Annie Sullivan overcame incredible obstacles in her own life before becoming the “Miracle Worker.” She grew up poor, with little education. An untreated eye disease left her almost blind by the age of eight, and she went to a poorhouse for years after her mother died when she was ten. Even her horrible circumstances could not squash her intellect, and she was sent to the Perkins School for the Blind at age fourteen. After graduation, she was hired as a teacher for Helen Keller, a young girl who was both blind and deaf. This compelling biography of Annie Sullivan is made particularly special by the many large photographs throughout the book. When a photo of the subjects themselves isn’t available, another is substituted to give us a visual of the setting  for instance, of children at the Perkins Institute for the Blind. Having grown up with poorly illustrated biographies of both women, I found myself fascinated by the seeing the real pictures. The author describes the total devotion and link between the two women for the rest of Annie’s life. One picture is particularly telling. In it, Annie’s husband is between Annie and Helen. Annie looks over his shoulder reading the paper in his hands, Helen looks straight ahead in profile, and John is finger-spelling into her hands and looking at the camera. When I saw the photo, my first thought was that he couldn’t be happy  and indeed, John left the marriage right around the time the photograph was taken. Nonfiction Monday is hosted at Tales from the Rushmore Kid.